Iran’s missile program does not make headlines as often as its nuclear efforts. 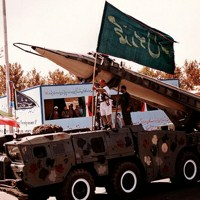 But the missile program is tied to the nuclear program in two different ways: technically, because Iran has been keen to develop rockets that could carry a nuclear warhead; and legally, because United Nations sanctions against Iran target the missile program almost as much as the nuclear one. What would happen to Iran’s missiles in the event that a deal can be struck with Tehran regarding its nuclear program remains a largely unexplored issue.